Red Dead Online could be spectacular on PC. Will it ever come to PC? We've collected all of the evidence in our everything we know about Red Dead Redemption 2 roundup. If/when it eventually comes, it will surely come with the open world multiplayer mode, Red Dead Online. Red Dead Online lets you roam the huge map with other players. You can form posses, race, fight other players, and hunt. It hasn't reached its potential on consoles yet, but it could be huge on PC if and when Rockstar starts properly expanding the mode. Red Dead Online may be following a similar pattern to GTA Online. For the first year there was little to do in GTA Online except drive around and compete in quickfire missions for in-game cash. That all changed when Rockstar added co-op heists and kicked off a series of updates that allowed players to own military bunkers and run their own businesses. Red Dead Online certainly isn't there yet. After a brief series of introductory missions you're free to form a posse and ride around the world doing... not much. There are some competitive multiplayer modes and some samey cooperative missions, none of which pay terribly well. For completeness, here's an overview of the activities currently available in the Red Dead Online beta on consoles, which we would expect to see like-for-like on PC. Races Basic checkpoint races against other players on horseback. Shootout Team deathmatch and free-for-all deathmatch. Make it count Red Dead Online's battle royale mode. It comes in 16-player or 32-player versions. You have to use a bow and some throwing knives to become the last player standing in a shrinking area. Name your weapon Deathmatch, but killed are valued differently depending on the weapon you use. The trickier the weapon, the more your kills are worth. Most Wanted Deathmatch, but you get more points for killing players toward the top of the leaderboard. Hostile Territory Occupy capture points and score more than then enemy team. Fishing Catch the fish, sell the fish. There are other smaller activities available in the open world. You can take out camps and use treasure maps to track down caches. You can hunt, too. It's not a bad baseline to to add to, and we expect Rockstar to grow the mode a lot in the coming years. Let's start with some GTA Online issues that we certainly don't want to see in Red Dead Online. The main problem: hacking. Public servers in GTA Online are riddled with trolls breaking the rules of the world to grief players. It can be funny sometimes, but it can make the game too chaotic and unstable to enjoy. Players are already using the lasso in Read Dead Online to grief new players, so there's always a worry RDO could descend into the same pattern. As a result GTA Online is much better as a co-op experience with friends, but we have experienced a few issues trying to work through the heists—it's unclear whether the game is to blame, though. The console version of Red Dead Online has been more or less stable so far, which is a big improvement. RDO is currently in beta, technically, so we can expect further improvements here. GTA Online's heists have some low moments, but they are ambitious and satisfying when everything comes together. Red Dead Redemption 2 doesn't have equivalent missions in singleplayer, but it would be great to see some more ambitious robberies and high-level challenges. 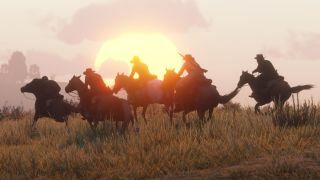 There isn't much progression in the console game at the moment either, though Rockstar will surely update the game with new clothes and horses to buy with in-game currency or the already-present gold bar real money currency. A lot of the initial complaints directed at Red Dead Online so far have been directed at the economy, specifically the low amounts of in-game money activities dole out. Rockstar since increased cash and gold payments across free roam missions, events, and in other modes like Showdown. Weapon prices have come down too, which suggests Rockstar is prepared to make ongoing tweaks to keep players happy. The online mode has an opportunity to loosen up Red Dead Redemption 2's very serious tone. GTA Online has laser cannons now, so anything goes. Also Fortnite has shown us how effective seasonal events can be. There's huge potential for Undead Nightmare style October events, and other dynamic seasonal changes in Red Dead online. In a statement at the start of 2019 Rockstar hinted at a few of these elements, promising "all-new missions" and "a range of Dynamic Events throughout the world". More racing and showdown modes are planned too. Of course we need the game to be announced for PC first. We'll keep our fingers crossed, and keep an eye on the console version for any clues about a Red Dead Online PC release.